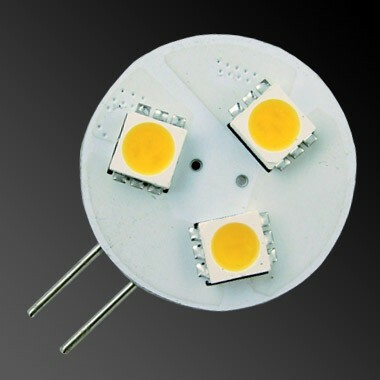 Our lowest output LED G4 disc, the 3-LED G4 has been designed to replace the light output from a 5W G4 halogen. Designed to sit sideways into the light fitting. The G4 halogen is one of the most common lamps used in caravans and motorhomes and is easily identified as a small glass lamp with two short pins spaced 4mm apart. The G4 halogen is commonly used in ceiling lights, wall lights, downlights and reading lights and is easily replaced with an LED alternative. This disc type LED G4 is used to provide light in one direction and are best used in downlighters, ceiling lights and spotlights. 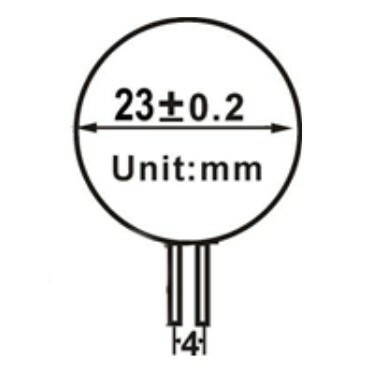 The 3-LED side pin is designed to replace a 5W halogen and sits sideways in the light fitting. We also have this 3-LED G4 as a back pin version and the same style with a larger number of LEDs if a higher output is required. All of our G4 LED lamps are voltage regulated and are not polarity sensitive - i.e. the LED will light up whichever way the positive and negative power is applied so no rewiring is required.